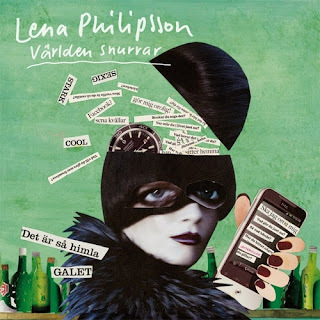 Lena Philipsson's long-awaited album "Världen snurrar" is finally out and though after release of "Nästa Säsong" and unveiling list of indie and hip-hop producers in media I've started to be afraid Lena's over with disco, the album has turned to mostly dance-record. Very different album from cold 80s electro-sound of Christian Falk-produced "Blir Galen" and "Vart Tog Du Vägen" to 90s house of "Igen och Igen", from retro movie-ballad "Ett Hjärta" to utterly schlageristic "Live Tomorrow" produced by Peter Boström. Besides "Live Tomorrow" and "The Botten Is Nådd" Peter has produced two other biggest highlights of the album - brand new single "Du Följer Väl Med?" - cover from the latest Sarah Connor's album which has received a big Guetta club-production and Septemberish electro-disco track "Världen Snurrar" with pretty adorable dreamy piano part. Very tight album pleasing every Lena's fan with at least few tracks. You can listen to both of our faves below and "Blir Galen" here.